I've chosen these images for a variety of reasons, not least because I think they're beautiful. These are amazing objects that I hope our members, and observers in general will take the time to seek out. How easily visible are they from your location? I don't know, but I'm hoping that you'll send me your observations so I can find out. Image was provided courtesy of Rainer Sparenberg, Stefan Binnewies, Volker Robering, Josef Pöpsel and Beate Behle: www.capella-observatory.com. Please visit www.capella-observatory.com for more information about this image. This month I've gone for a pair of galaxies, and an iconic pair at that. There's nothing like an intergalactic collision to encourage a little star formation, in which case I can't help wondering what the deep-sky observing must be like from within these two galaxies. The Antennae galaxies are unfortunately low in UK skies, but from locations further south are quite spectacular, or so I'm told. They're certainly an amazing object for deep-sky imagers as you can see with those long tidal tails. As you might expect, the Hubble Space Telescope has a great close up view of the centre of this galaxy wreck. Image Courtesy of Don Goldman (copyright 2019). Don has much more information about this image and object (along with a wonderful larger version) on his website. Another image packed with a range of objects from Don. We have a pair of large reflection nebulae (Ced 111 and Ced 110), Herbig-Haro objects, plenty of dark nebulae from the enclosing Cha I dark cloud complex, and finally an infrared nebula too. It's taken a moderately wide-field to grasp all this detail and the detail is impressive. Don's website has a much larger version that's well worth a look. This image of The Owl nebula (M97) and Hickson 50 was provided David Ratledge. You can find a larger version and more details on David's blog. We haven't had a planetary nebula since last summer, so I've chosen an image of a well known object: the Owl nebula (M97). But David's not known for imaging the Messier list. His specialty is the more obscure objects of the deep-sky. What I like best about this image is that to the left of this showpiece nebula, less than 21 arc-minutes away, is the faintest of the Hickson Compact Galaxy groups. David's image of the Owl nebula (M97) with a close crop of Hickson 50 (HCG50) he provided inset. David has a larger version of this crop on his blog. Something for large and small telescopes, though I think it'd need a lot of aperture to take both in, or a camera or course. It goes to show that it's worth digging a little deeper into your field of view. About 5.5 degrees north of Sara's last contribution to Picture of the Month, and in the same constellation as our Picture for last month, is an area of dust a few light-years across that obscures our view of the emission from some of the star forming regions that fill Orion. This month we're a little north of Barnard's Loop with a wonderful monochrome hydrogen-alpha image of the dark nebula designated as LDN1622. Cosmic dust, and what lurks within, is a particular interest of mine and I think monochrome really brings our all the subtle detail inherent in these objects. I haven't found any mention of this nebula being observed visually, and haven't tried myself in my light-polluted skies, so I'd guess that the background emission isn't bright enough for that. A shame, but narrow-band imaging is a different matter. By the way, the fact that this object shares a designation closely with this month's Galaxy of the Month (NGC 1622) is purely coincidental. The fact that it's only about eight degrees from one of January's Double Stars, and twenty degrees from NGC 1622, like-wise. There's so much to observe in this part of the sky. This image was provided courtesy of Steve Crouch. Please visit his website for a better view of, and more details about this image. This month I bring you more dust clouds. In those clouds are the luminous stock waves caused by the outflow from forming stars: Herbig-Haro objects. In Steve's image we're looking at a 20 arc-minute field on the edge of the Orion Giant Molecular Cloud Complex. He's chosen to feature the arcing structure of Herbig-Haro 222 which is in the upper centre of his image. Though admittedly not as impressive, I can see at least seven other Herbig-Haro objects in there too, and perhaps unsurprisingly, this region of the sky is packed with them. 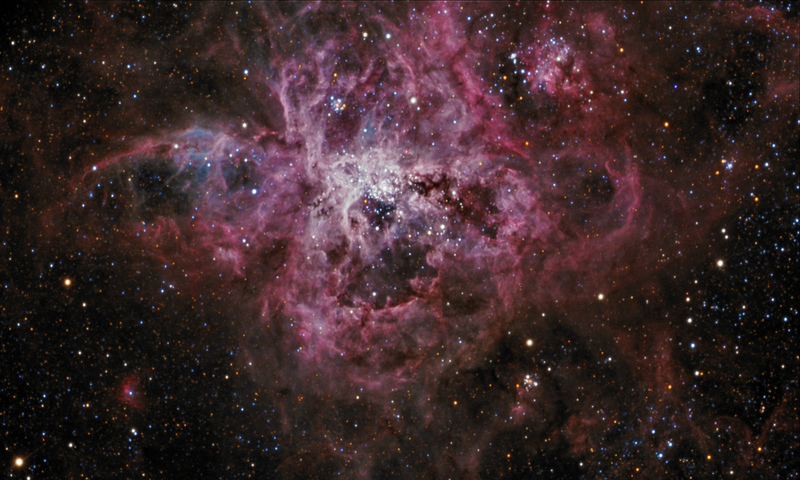 Up in the top left corner is IC 428, which is... I don't really know other than to say it's a bright nebula. I've seen supernova remnant in dso-browser (which seems unlikely), NED calls it a nebula, and SIMBAD claims it's an Object of unknown nature . Whatever it is, it seems that it was discovered by Williamina Fleming on Harvard plates from the late 1880s. Image Courtesy of Don Goldman and Josep Drudis. Don has much more information about this image and object (along with a much larger version) on his website. I admit it, I'm following in the footsteps of NASA's APOD for this month. Don and Josep already gained that distinction in January this year. In my defense, you can plainly see why. This is a view of 4.5 degrees of the Large Magellanic Cloud which is simply packed with emission nebulae, supernova remnants and a great deal more. Don's website has an annotated version of this image that's well worth a look to get a feel for the abundance of deep-sky objects. This is clearly a playground for imagers, but Steve Gottlieb's 2013 post in the Deep Sky Forum shows that there are some delights available to visual observers in that dense region of nebulosity to the bottom left. In fact it might be worth reading all Steve's posts on observing the LMC. I wonder if many have tried using Electronically-Assisted Astronomical (EAA) observing in this area? This image of Arp 331 was provided David Ratledge. You can find a larger version and more details on David's blog. This may be a familiar object to some of you, but I've never set an eyepiece on it. David's fabulous image certainly makes me appreciate why many dedicated galaxy hunters love these galaxy groups. The chain in this image is just under fourteen arc-minutes long with NGC 383 sitting in the middle. I chose these galaxies because Owen's already featured Arp 331 as his Galaxy of the Month back in 2011, so he won't be doing that again. I suggest you take a look. Unfortunately, my guess is that these galaxies are beyond the reach of my even my 10-in scope, especially with suburban UK skies. Owen noted it being observed with a 16-in scope, and it's possible in a 12-in according to Night Sky Observer’s Guide Volume 1. Imaging it is clearly possible given David's terribly light polluted sky. So visual or imaging. why not give it a go? I've included nebulae of all kinds, globular clusters, and even galaxies in Picture of the Month, but I've realised that open clusters have been neglected recently. Which to choose? There's a wide selection available to me with the return of the Milky Way. Despite that I've never seen this month's cluster, though it's not hard so I've been told, because it's not visible to northern observers. I've been assured that it is spectacular by those that have seen it. This month I'm featuring one of the iconic open clusters and, if you haven't already identified it, it's called the Jewel Box (NGC 4755)... for obvious reasons. Steve has produced a wonderful image, but I bet it's even more special through the eyepiece. This image of Patchick 5 was provided by Bernhard Hubl, and you can find much more information about it on his website. More nebulae, and this time a more obscure planetary that has featured as an Object of the Week on the Deep Sky Forum (DSF). Being around half the angular size of M57, half the visual apparent magnitude and at about twice the distance Patchick 5 is certainly not a bright object! Based on the comments I suspect that this is one for the astroimager, like Bernhard, but perhaps you happen to have a huge telescope and excellent skies. I'm drawn to the vibrancy of Bernhard's image which comes close to that which I see through the eyepiece. Unfortunately this comes across much better on in the larger image on Bernhard's website. Of course he's extracted much more detail from this bipolar planetary, which is why I've decided to add his close crop too. A closer crop of Bernhard Hubl's image of Patchick 5. Image Courtesy of Don Goldman. Don has much more information about this image and object (along with a larger version) on his website. I may have chosen Sh2-64 as the feature object this month, but this wonderful widefield (2.5 degrees according to Don) contains much more. Sh2-64 is the emission nebula in the bottom right corner and it's not the only one since the whole area is busy with star formation. The extent of the dark nebulae on show attests for the size of dark clouds in the direction of the Serpens-Aquila rift. Image was provided courtesy of Martin Pugh who has a larger version and more information available on his website. OK there's a lot more than "just" a reflection nebula going on in this striking image from southern skies. A globular cluster (NGC 6793) and a variable nebula (NGC 6729) around R Coronae Australis... there's even some emission thrown in! All of which made choosing this image pretty easy for me. Martin's done a great job with this version, but with processing by Eric Coles it landed an APOD last year. Image was provided courtesy of Rainer Sparenberg, Stefan Binnewies, Volker Robering, Josef Pöpsel and Beate Behle: www.capella-observatory.com. For more information about this image. Too many galaxies in a row for me, so I've decided to head south and back to the Milky Way for a stunning globular cluster. Omega Centauri may not be visible to me in the UK, but for southern observers I'm told it's a naked eye object! The largest and brightest globular cluster in the night sky, and one with a more complex history than most in our galaxy. This image is courtesy of SSRO (Star Shadows Remote Obs. ): Warren Keller, Steve Mazlin. A larger image of NGC 4945 in Centaurus is available on Warren's website. It's still galaxy season here in the North, but I've chosen to head to the southern skies for this detailed image of a distinctive galaxy. I love the dusty dark lanes and star forming regions... reminds me of our home. NGC 4945 is a spiral galaxy located near the bright star Zeta Centauri. Discovered by James Dunlop in 1826, it is thought to be similar to the Milky Way Galaxy. X-ray observations however, show that the galaxy has an unusual, energetic Seyfert 2 nucleus that may house a huge black hole. NGC 4945 is one of the brightest galaxies of the Centaurus A/M83 Group- a large, nearby group of galaxies. This image of Markarian's Chain is provide with kind permission of David Davies from his observatory in Cambridge, UK. You can click the image for a larger version. It's galaxy season so I decided to look for some galaxies to feature this month. Fortunately David provided this great image of the iconic Markarian's chain that he took last year. Benjamin Markarian who died on 29 September 1985 was an Armenian astrophysicist who gave his name to Markarian's Chain of galaxies in the Virgo Cluster of galaxies after he discovered that this string of galaxies moves with a common motion. The Virgo Cluster is the nearest cluster of galaxies and contains over 2000 galaxies. It has a noticeable gravitational pull on the galaxies of our own Local Group of Galaxies which surround our Milky Way Galaxy. The centre of the Virgo Cluster is located about 70 million light- years away toward the constellation of Virgo. This image shows part of Markarian's Chain and is marked by the Messier galaxies M84 and M86 to the right and the interacting pair of galaxies NGC 4438 and NGC 4435, known as The Eyes or ARP 120, in the centre of the image. There are many small, faint galaxies in this image. The image comprises 20 luminance and eight each of RGB subs, all of five minutes exposure with a 107mm APM triplet and an QSI 583 camera. Image was provided courtesy of HFG2 - Image Courtesy of Don Goldman (Astrodon Imaging). Don has much more information about this image and object on his website. Planetary nebulae are far from uniform in appearance which is one of the reasons I find them interesting. It's also a good reason for their regular appearance as Picture of the Month. That said, when this image of HFG2 landed in my inbox I was struck by the profusion of detail from the PN itself and its interactions with surrounding material. Don talks about some of this on his website where you can get a closer look at a larger version. HFG2 is listed under the name FEGU 248-5 in SIMBAD and also appears to be PK247-04.1, which is number 159 in the Perek-Kohoutek Catalogue of Galactic Planetary Nebulae (2000 version). I managed to find HFG2 on page 84 of the Interstellarum Deep Sky Atlas which suggested a telescope of 300mm of more aperture... unsurprising for a 15–17 magnitude planetary nebula. I may have to stick with images. Don also believes that this is the first colour image of this object. Does anyone know differently? Has anyone seen HFG2 (PK247-04.1) visually? Image was provided courtesy of Bob and Janice Fera. They have more details about this image on their website and a much larger version that's worth a look. Another year and one more fabulous patch of nebulosity. Sorry, I couldn't resist this wonderful image by Bob and Janice Fera that covers about 40 arc-minutes of sky. Near the border of Monoceros and Canis Major, the area around VdB 93 possesses a few identifiers... as you might expect. IC 2177 and Sh 2-292 seem to be amongst them, as is the arguably more memorable Seagull Nebula. We're looking at the head of the Seagull Nebula in this image, with the bright Be star HD53367 in the centre lighting up the surrounding gas. HD53367 is also a close double and variable star (RST3489 and V0750 Mon respectively). The remainder of the Seagull Nebula lies out of shot to the East (up in this case) as Sh 2-296, an HII emission region. Image was provided courtesy of Alson Wong. Please visit his website for more detail about this image and a number of much larger versions. Following on from the dark nebulae near NGC225 last month we have some really significant cosmic dust. These are the dark nebulae in and around the Taurus dark cloud with all its wonderfully complex chemistry. Alson's wide angle image taken from California is packed with Barnard numbers and is more than ten degrees across! It shows them off beautifully against the starry backdrop. This image feels three dimensional to me, and those on his website are larger and better. Image Credit: Processed by Warren Keller, who has a larger version, and acquired by David Kopacz. With my small telescope Cassiopeia is one of my favourite places as the haunt of many fine open clusters one of which is NGC 225. It's one of Caroline Herschel's discoveries, but not her best. I'd have to say that NGC 7789 nearby tops it visually. So why an image of this cluster for Picture of the Month? I was caught by the nebulosity from the reflection nebula and those dust clouds in Warren's image. Combined with those jewel-like stars I think it adds a great deal to the interest of this cluster. I just don't get that in the eyepiece. Perhaps a bigger telescope and darker skies would help? Oh, and the name? As Warren points out The Sailboat Cluster was coined by Dr. Rod Pommier in Astronomy Magazine. Image was provided courtesy of Makis Palaiologou, Stefan Binnewies, Ralf Kreuels and Josef Pöpsel: www.capella-observatory.com. Please visit www.capella-observatory.com for more information about this image. Another planetary nebula from the Capella Observatory, but this one's visible to those further north than my last selection in Norma. Not that it'll be easy at 15th magnitude and about an arcminute in diameter. One for the large telescope or imager armed with an O-III filter. Never-the-less this image shows why it's worth having a go due to its interesting irregular shape and brightness variations. Image of IC 1318 (the Gamma Cygni Nebula) was provided David Ratledge and you can find a larger version of this image in David's 2014 archive. I know that many of our members live for views of galaxy groups outside the plane of the Milky Way, but I'm a galactic person, and this is one of my favourite areas of the night sky. David's filtered widefield image (I'd guess more than 5 degrees across) is packed with my usual targets: open clusters. What's so striking is that they're almost drowned out by nebulae including IC1318 A, B and C; a host of dusty dark nebulae; and the Crescent Nebula (NGC 6888). Whether my sky is dark enough to even catch a glimpse I shall see, but my UHC and OIII filters are on standby for late summer and early autumn. The data for this image was collected by the CEDIC team (Bernhard Hubl, Justin Kabaus, Christoph Kaltseis, Markus Blauensteiner) on one of their trips to Chile (2015). The final image was processed by Bernhard Hubl, and you can find a lovely large version of this image on his website, along with more information about it. Inspired by one of our speakers at this year's Annual Meeting, Bernhard Hubl, I thought I'd feature another southern gem. So I raided his Chile archives for something suitable, and I think I found it. This is a galaxy that looks more like a cluster in this image due to it's close proximity (only 200,000 lightyears). I particularly like the composition with NGC 104 nearby, but there are a host of NGCs in this frame if you care to find them all. Image was provided courtesy of Rainer Sparenberg, Stefan Binnewies, Volker Robering and Josef Pöpsel. Please visit www.capella-observatory.com for more information about this image. I've had a run of galaxies recently and I've decided it's time for a change. On top of that the nights are getting very short and bright here in the UK. To that end, I've chosen to head south for the summer and found a wonderful planetary nebula. Shapley 1 is a fine ring nebula, but quite a lot smaller and fainter the Ring Nebula (M57) that's around in the northern sky again. That magnitude 14 white dwarf at the centre seems to be a close binary pair, and our view is perpendicular to their orbit. This means that we're probably seeing this planetary nebula from a polar perspective. This image shows lots of subtle (and not so subtle) detail in the bright ring, and the faint outer halo too. Image was provided courtesy of Adam Block (Image credit: Adam Block/Mount Lemmon SkyCenter/University of Arizona). Adam has more detail about this image and an uncropped version on his old website which is worth a visit. More galaxies this month, many more in fact. This image of Adam's caught my eye immediately since it's so dynamic. That's right, galaxies are more interesting when colliding. Apart from the main feature galaxy NGC5754 we have three more showing significant detail in this beautiful image. These are NGC5752, NGC 5755 and NGC5753 I believe. This is the interacting group known as Arp 297 for your enjoyment this May. Image was provided courtesy of Bill Snyder who has a much larger version on his website and more detail about the image itself. It's Spring time in the northern hemisphere, and that means galaxies for the deep-sky observer. It also means that the nights are getting shorter at northern latitudes, so make the best of your observing opportunities. I've chosen another galaxy this month, or in this case a pair of colliding galaxies: the Siamese Twins. These two are in the early stages of their collisions and still look like spirals with very minimal distortion. A little investigation reveals that the image above is only about 13 arcminutes across: these are not large objects. Kepple and Sanner suggest a 12–14 inch telescope to observe the pair, but they may be visible as a fuzzy "V" in smaller scopes? I think that this is a beautiful galaxy, but what's more important is that it's not only visible to imagers and those with huge telescopes. You can find it with small scopes, and Owen claims that the dark lane is potentially visible for those using 8 inches of aperture and more. This image of NGC 4565 is provide with kind permission of David Davies from his observatory in Cambridge, UK. This LRGB image reveals the dark dust lanes of the edge on spiral arms partly obscuring the bulge of the core. NGC 4565 is approximately 40 million light years away and is thought to be a barred spiral galaxy 100,000 light years across, similar in size to the Milky Way. Several other galaxies can be seen in this image including NGC 4562 to the lower right. ... there's more hidden in this field to hunt down with cameras and large dobsonians. As I told this month's contributor when a contacted him to ask permission to use his work, I liked the idea of an image of the NGC 3372 (I'm a big fan of eta Carinae) this February. Browsing around the internet one of his took my fancy and my mind was made up... until I spotted his amazing image of the Vela supernova remnant! But he wasn't finished with me! In addition to granting permission, he pointed me at a more recent version he's created using his original and adding Digital Sky Survey (DSS) data, and this is the result. This mosaic of the Vela SNR is provide with kind permission of Robert Gendler. There are larger and even annotated versions on his website. As you've probably gathered I have a soft spot for nebulosity, but that’s an incredible object by any standard. It's about 250 Parsecs distant and still fills around 8 degrees of the sky, something that's probably taken it 11,000 years! It's also so large that there are many deep-sky objects within its bounds and many more to be seen in this image. Definitely take a look at the version marked up with DSOs on Rob's website. I think this is a stunning image (or collection of images, it is a mosaic), but I'll leave it to you to decide which version is your favourite. This image was provided courtesy of Steve Crouch. Please visit his website for more details about the image. In truth I'm not really much of a galaxy observer which might be considered heresy in a Deep-Sky society. In order to mitigate this infringement I've decided to start the new year with a nice bright galaxy. Those in southern Europe and the US should be able to find NGC 1291 as Steve has from Australia. Unfortunately you won't be so lucky from the UK where it's not visible, so it's one for the winter vacation perhaps. I chose Steve's image because NGC 1291 is a striking galaxy that shows plenty of detail to the camera that I suspect would need a big telescope so see visually. It's also another of those objects that are so good they named it twice. It seems to bear the designation of NGC 1291 (James Dunlop) and NGC 1269 (John Herschel). This image was provided courtesy of Sara Wager. Visit her website for more details about the image and a larger version too. Nebulous service has been resumed with a large emission nebula that's probably impossible for me to see from my relatively light polluted location. If you're luck enough to find yourself under lovely dark and transparent skies try for NGC 1499 with the naked eye or binoculars, especially with the aid of a deep sky filter or two. For once those of you with large telescopes are probably going to struggle, and astrophotographers... I'd guess you've probably already been here, right? I've got a soft spot for monochrome. 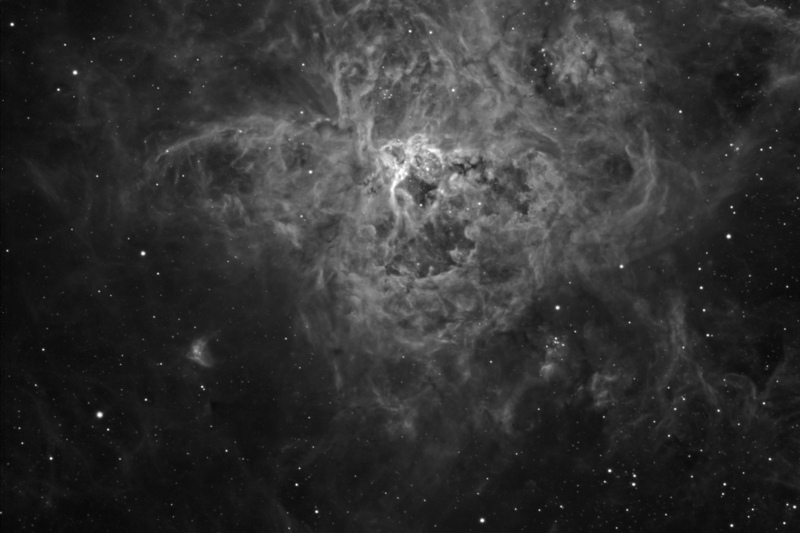 It seems to emphasise detail so much better than colour in my opinion, and Sara's managed to capture a wealth of texture and detail in this nebula. It's most likely that we have Xi Persei in the upper middle of this image to thank for that... and Sara of course. Image was provided David Ratledge and you can find this image in David's 2014 archive. I've spent some time over the last couple of months in Cassiopeia looking at open clusters. But this one – NGC 559 – somehow escaped me. It's not going to do that for long now I've seen this wonderful image of David's! It's crisp and contrasty, capturing the things I love best about these bundles of stars. Whilst not particularly bright, NGC 559 has a Trumpler classification of I1m which should help pull it out from the background. Whilst deciding on an image for Picture of the Month I noticed I've been a little nebulosity obsessed recently. I also found that open clusters haven't really featured, and that's a pity because they're fantastic objects to chase. So I've put that right. Image was provided courtesy of Bill Snyder. Please click on the image to be taken to a much larger version on his website. He has much more detail about the image itself. So after a brief sojourn to galaxies I'm back to a couple of favourites: Cepheus and nebulous open clusters. The Iris nebula ticks those boxes very nicely, except NGC 7023 is a reflection nebulae surrounding that bright 7th magnitude star in the middle. According to Archinal and Hynes (Star Clusters) there is an open cluster, but it has nothing to do with the nebula. Collinder 427 is just to the right of NGC 7023 itself in this fabulous image, but that's close enough for me to mention it, though as a poorly detached cluster with relatively few stars it isn't really the highlight here. However with the advent of the Caldwell Catalogue (NGC7023 is No. 4) it seems that the supposed open cluster surrounding that central star (Collinder 429) might be real again! All very confusing as usual and I'm not going to pretend that I have an answer. NGC 7023 is frequently imaged, but I think that Bill has framed this subject extremely well and the dust clouds lend great depth. Well worth observing visual with any aperture. Back to the southern skies this month with data collected by The Star Shadows Remote Observatory (SSRO) at PROMPT2 - CTIO near La Serena in Chile. I also thought it was about time a galaxy appeared on the Picture of the Month and this is a real beauty, and its brought friends. This image is provided with the kind permission of Warren A. Keller. The images were acquired by SSRO: Warren Keller, Steve Mazlin, Steve Menaker, Jack Harvey. Please click on the image to be taken to Warren's website for a higher resolution version, its really worth the effort. IC 5332 in Sculptor is a seldom seen Sc-type spiral galaxy. At a distance of 39,000,000 light-years, it is quite faint and considered 'unremarkable.' Sadly, precious little is written about it but I hope this image will spark some interest in IC 5332. There are numerous, fascinating galaxies surrounding the target, the most interesting of which, PGC 132690 appears at 4 o'clock. This image was provided courtesy of Sara Wager. Please visit her website for much detail about the image and a far better version. Nights are getting darker at northern latitudes, astronomical darkness has returned to the UK, and Cygnus is overhead. I have a bit of a mission at this time of year: to explore the Veil Nebula. I've heard that its visible with the naked eye with the help of a good O-III narrowband filter from really dark skies, but it certainly isn't from any sky I've experienced. There aren't all that many supernova remnants accessible to my small scopes which makes the Veil a bit of a seasonal treat. Especially since the whole complex favours a short focal length due to its huge size. However, the individual NGC objects can be explored in detail with a bigger aperture. So the Veil has something for everyone. I love the visual challenge of trying to pull detail from the background glow, but as Sara has shown with this wonderful wide-field mosaic, it responds really well the narrowband imaging. Her web page highlights the Eastern and Western Veil where I've had visual success… albeit somewhat less well defined. This image was provided courtesy of Robert Gendler, please click on it to see a larger version. I've chosen another wide-field image for the Picture of the Month. This fantastic mosaic spans at least three constellations and is packed with deep-sky objects including open clusters, bright and dark nebulae and a globular cluster too. For us beginners, the Messier catalogue is well represented by, I think, 8 objects. Most importantly this is the centre of our own galaxy and I find the view staggering. It's not easy to see from my northern latitude in the UK, and light pollution robs us of a great deal, but I find this image is mesmerising. What deep-sky observing is made of. The image in this article doesn't to justice to Rob Gendler's work: it's just too small. Click on it to see a larger version, but better yet, visit Rob's website to learn more about the Galactic Center and view some really huge versions. There's one that's annotated too. Image was provided courtesy of Stefan Binnewies, Otto Guthier, Rainer Sparenberg and Josef Pöpsel. Please visit www.capella-observatory.com for more information about this image. This outstanding image is here this month because I spotted it on www.capella-observatory.com and was stunned by the colour and how many deep-sky objects it contains. But my ulterior motive is that this is a composite of images taken on film. I'm still a film photographer in the daylight, and the detail and vibrancy of this image leaves me stunned. Please click on the image above to view its larger brother it's well worth it. It's not the easiest region of the sky to observe from the UK, because it's low and the skies are always bright, but those further south may have more success in June. Oh, and there are also a couple of planets nearby this year, but we don't speak of them. Image was provided Bernhard Hubl. Please visit his website to see more of his work and for more details about the image. Globluar cluster season is here and this is one of the best of these ancient objects in your web administrator's opinion. Bernhard has done a fantastic job of resolving this dense ball of stars and bringing out the colour in many of them. It's not a difficult object to find, but worth the effort in any sized scope. Not too difficult to resolve a large number of stars in a large scope. More of a challenge in a small one though. Image was provided courtesy of Bob and Janice Fera. Please click on the image to be taken to a much larger version on their website. All the same I'm happy with my choice. 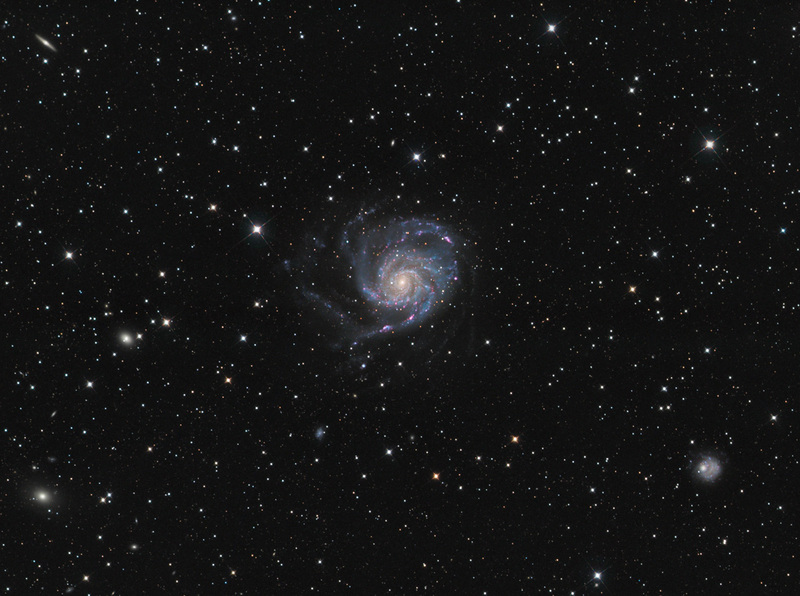 M101 is not a particularly difficult object unless you have poor skies. That's exactly what I've got, so I've never seen more than a smudge of light under the best conditions, and that's reason enough to include this detail packed wide field image. For those with small scopes or binoculars and skies like mine M101 can be an interesting hunt in itself. For something tougher why not go after its HII regions. It's also worth taking a look at the full size image on Bob and Janice's website, because there are plenty of other galaxies to chase in this field! Image was provided courtesy of Rainer Sparenberg, Stefan Binnewies and Volker Robering. Please visit www.capella-observatory.com for more details about the image. This is a beautiful image of an extraordinary planetary nebula in the Southern skies. Its status as a planetary nebula is relatively recent due to its size and unusual structure, being settled by spectroscopic measurements. Hubble took a look a few years ago and provided supporting evidence for this being a binary system, so there's a double star in the Picture of the Month. It would appear that opinion has been divided over the discoverer of this object: John Herschel from the Cape in 1835 or James Dunlop in 1826. NGC 5189 has been shown to correspond to Δ252 in Dunlop's catalogue, and so it would seem that Dunlop was there first. It's also one of those objects with an impressive array of identities. Another nebula you might be thinking, and you'd be quite right. I've thrown in another open cluster too, NGC 2244, but there are no apologies. Being a small scope user I like the big and bold, and this image from Warren Keller and Michael Miller works just perfectly for me. A staggering 50 light years across, it is a nursery to NGC 2244, the 'new' (1M year old) cluster of stars at center. Dark veins called Bok globules give the rose its petals. As a guitar player, it has special meaning. Stemming from the medieval lute, the beautiful decoration around a guitar's soundhole is also called a rosette. Thanks to Michael Miller for acquiring the data. For a more detailed version, and a Hubble palette version too, please visit Warren's website: Billions and Billions.com. Auriga has been a favourite constellation of mine since I first pointed a telescope at the sky. Even a relative beginner with a small aperture telescope can find something to observe in and around the charioteer. To start with there are the Messier open clusters (M36, M37 and M38), but I love scanning the region to the SW of M38. I find that it looks slightly hazy to the naked eye on a good night - which would be welcome. I've recently caught the planetary and bright nebulae bug, and whilst researching those I discovered a new challenge sitting in plain view. In the image below, IC405 is in the bottom left. It contains a variable star (AE Aurigae) that is passing through whilst pouring radiation into the surrounding emission nebula. Apart from managed to squeeze another variable star into Picture of the Month, it's also a goal of mine to observe IC405… not an easy one from my location though. Continuing the two for one theme, in the top right of David Davies' image is emission nebula IC410, which contains another favourite type of target: an open cluster, NGC 1893. My very limited research has suggests that the nebula is probably a challenge too far for me, so the open cluster will have to do. Thank you to David Davies of Cambridge (UK) for allowing me to raid his archive for this image. For more images from David please visit his Flickr Photostream. Those with larger aperture scopes or darker skies may fair better, and as you can see, a camera can capture much more. I suspect that many of you have seen all this before, but it still makes a fabulous picture and I hope shows that there are objects out there to provide deep-sky observing for us all. I’m a fan of variable stars and I don’t get the chance to put an image of one on the website often. I'd have to admit that might be because they’re… not particularly spectacular normally. I think that T Tauri in the image above is an exception being associated with an interesting class of objects: the nebula surrounding the young star that also varies in brightness. This beautiful image was provided by Bill Snyder, who acquired and preprocessed the data that was subsequently postprocessed by Warren Keller. For a more detailed version please visit Warren's website: Billions and Billions.com. This month I've gone for some objects that I'm unlikely to see through a telescope. 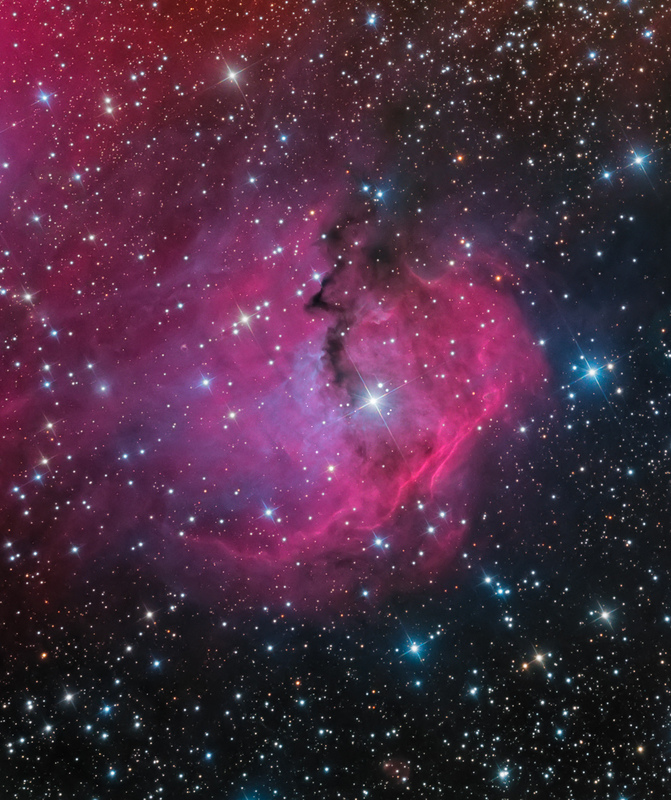 It's time to visit the southern skies again with both colour and narrowband images of a star cluster and its nebula. I'm a bit of a sucker for hydrogen alpha and the detail it seems to draw out of certain nebulous regions. This image by Steve Crouch from Australia brings out the extent of this gas cloud beautifully. On the other hand full RGB colour can be impressive too. Which do you prefer? Clicking on either image will open a new window with a larger version from Steve's site. This huge emission nebula complex in the Large Magellanic Cloud would more than cover the whole constellation of Orion if placed at the position of the Orion Nebula. It is visible with the naked eye as a hazy spot. Ha=195m, OIII=210m, SII=225m, R=G=B=30m all unbinned. Ha, OIII and SII combined as luminance over RGB layer. 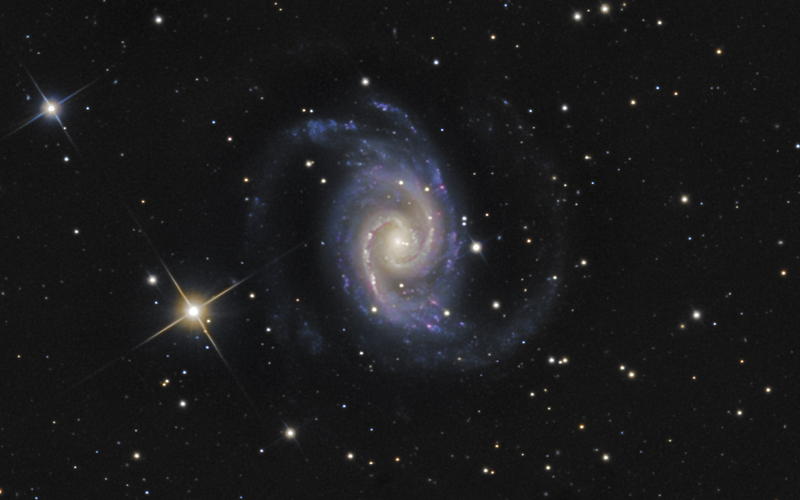 For more images from Steve please visit his CCD Astronomical Images from Canberra website. Image was provided courtesy of Makis Palaiologou, Stefan Binnewies, Josef Pöpsel: www.capella-observatory.com. Interestingly, Owen's covered this group in a previous Galaxy of the Month (November 2012). He used an image from the Digitized Sky Survey, but I think that this one is much better. Worth a read though. Capella Observatory provide a version of this image in which the galaxies are tagged with their names. That, and Owen's piece, should make it easier for those thinking of having a go at this one. Good luck. I took my first images of M27, the Dumbbell Nebula in Vulpecula three years ago with a DSLR camera and this year thought to return to it to see what my QSI camera would reveal. I have read that in 1991, it was discovered that there exists a very faint outer halo around the main nebula that extends out to at least twice the 8 x 6 arc minute extent of the 'normal' nebula but is around 1000 times fainter. I wondered, therefore, if I had any chance of revealing this outer halo. I gathered nine hours of H-alpha, Oxygen III and Sulphur II narrow band data and 3.5 hours of LRGB data during the three weeks 22 July to 10 August and have generated the two attached images. The first image is a narrow band HST palette rendering with an LRGB image of the stars blended with it. In this image S II data are assigned to red, H-alpha to green and O III to blue. The second image is also narrow band but with with H-alpha and S II data are added together and assigned to red (their normal colour), O III is assigned to blue and a synthetic green has been generated as a combination of O III (80%) and H-alpha (20%). This image has also been blended with the LRGB image and has the more normal looking colours. I have read that the outer halo is cooler than the hotter central nebula and we can see the chaotic boundary between the two as the hotter core pushes outwards. We can see the cool outer halo of gas from the original supergiant star penetrated by columns of glowing hydrogen-alpha originating from the central star in the regions from the top to the left side: 1 o' clock round to 9 o'clock.I'm wondering if what we are seeing is evidence of the central star precessing and periodically having outbursts of radiation. At the 4 o'clock location there is a powerful jet which seems to extend as an extremely faint extension beyond the outer halo itself. David Davies (21 August 2015). All images are courtesy of David Davies, Cambridge, UK. Please click on the images for the high resolution versions. For more images from David please visit his Flickr Photostream. Images Courtesy of David Davies, Cambridge, UK. Please click on the images for the high resolution versions. For more images from David please visit his Flickr Photostream. I first observed M92 visually several years ago and was struck by the beauty of this globular cluster that is often spoken of as the poor relation of the Great Cluster, M13 in Hercules. I understand that M92 is believed to contain stars that are nearly as old as the universe itself, since these stars contain just 0.5% of the metal elements that our sun contains. It is an intriguing object. Therefore M92 has always been my list for imaging. Two years ago I succeeded in capturing a relatively low resolution image in black white with my ED80; clouds prevented capturing any colour data. Friday 17 July produced a rare clear night with stable seeing and reasonable transparency. In planning the image capture I could see that there are many galaxies in the background of this area of sky and so offset the field of view of the image to also capture what I could of the background galaxies. I elected to use my Equinox F/7.5 ED120 refractor rather than my faster Newtonian to get a wider field of view and as clean an image possible, without diffraction spikes. A test exposure time of five minutes showed that I would get sufficient signal but not saturate the brighter stars. To reduce the risk of not having a complete set of colour data, I captured a set of RGB images first and then captured the luminance data I could before the onset of dawn stopped work. Data capture started around midnight and I had to stop at 02:20 as the sky was brightening. I managed to capture two and half hours of data. I've attached two images. The first is the complete LRGB image. The second image (NGC 6332) is a crop from the lower right part of the frame. This has been enlarged by a factor of two and is shown as a negative image. I have annotated it with the names of some of the galaxies that I've been able to identify from the NGC and LEDA catalogues. The brightest galaxies are magnitude 13 to 14; the smaller galaxies still showing a distinct shape are around magnitude 16 to 17 and the faint, tiny smudges are around magnitude 18 to 19. The faintest galaxy I've been able to identify is magnitude 19.2. I've also identified the double star HIP 84333 but my studies show that the apparent double visible in the image is an optical double; the true binary is only 0.4" from the primary and was discovered by the Hipparcos satellite. The image scale of the galaxies image is 0.62 arc sec/pixel - half that of the main image image scale 1.24 arc sec per pixel. Camera: QSI 583 with SX Lodestar as off-axis guider Automatic focussing with Scopefocus. The colour subs were plagued by satellite trails so I used median stacking in Deep Sky Stacker to eliminate them (mostly). Pixinsight w used to align, calibrate and integrate the colour frames. Photoshop was used to assemble and finish the LRGB image with a little saturation boost applied to the stars and a little high pass sharpening applied to the galaxies. David Davies (21 July 2015). So there are some challenges to those with large telescopes and other imagers. Can you provide us with some observations of these objects? I realise that Hercules is slipping to the West, but the nights are getting darker... and there's are always your archives to scour. And someone has taken a look! Dale Holt has pointed his 20 inch telescope and Watec 120N+ deep sky video camera in the direction of M92. Visit his blog to find out more and see his sketches. Something from the southern skies this month with data collected by	The Star Shadows Remote Observatory (SSRO) at PROMPT2 - CTIO near La Serena in Chile. This image is provided with the kind permission of Warren A. Keller. The images were acquired by SSRO: Warren Keller, Steve Mazlin, Steve Menaker, Jack Harvey. Please click on the image to be taken to Warren's website for a higher resolution version. NGC 6744 in Pavo likely resembles our Milky Way, and is one of its largest and closest neighbors. At 30,000,000 light years distance, it is approximately twice the diameter of our own galaxy. Its flocculent (fluffy) arms are rife with pink, HII star forming knots. This data set from 2014, is the second I have processed from the SSRO archive. I dedicate this work to the late Tammy Plotner, who passed away at much too young an age. She was a great friend to astronomy, and a supporter of mine. May you go among the imperishable stars! Image Courtesy of David Davies, Cambridge, UK. Please click on the image for the high resolution version. For more images from David please visit his Flickr Photostream. Here is a target from Ruben Kier's book The 100 Best Astrophotography Targets . This is NGC 4725, AKA "The Ringed Galaxy" or "The One-armed Spiral Galaxy" in Coma Berenices. Also in this image is NGC 4747 (top left) which is interacting with NGC 4725. To the right we can see magnitude 13.5 NGC 4712. NGC 4725 is about the same size as the Milky Way and about 41 million light years distant. One of my aims in imaging this galaxy was to capture the faint outer halo of NGC 4725 and also to see if I could image any of the disrupted tails from NGC 4747. Scanning this image reveals many small faint galaxies. This image comprises 12 x 10 minutes of luminance, binned 1 x 1 and 5 x 5 minutes each of RGB binned 2 x 2 captured with a F/4 Newtonian and QSI 583 camera with a Lodestar as off-axis guide camera. Image capture was with Nebulosity V4; calibration and stacking with Deep Sky Stacker and processing with Pixinsight and Photoshop. This is a crop of the original image. David Davies (22 May 2015). This is my first observation of the Hickson 44 group of interacting galaxies in Leo some 80 million light years away. The group comprises NGC3190 (incorporating NGC 3189) in the centre; NGC 3187, a heavily distorted galaxy to the right; NGC 3185, a barred spiral galaxy to the bottom and the big elliptical galaxy NGC 3193 to the upper left. Many other fainter galaxies are visible in this image. I captured the data for this image on the nights of 10th and 14th April 2015. The exposures were restricted to 5 minutes each to prevent the brightest stars (magnitude 7.6) saturating. The image comprises 28 luminance subs to try and capture these faint structures plus nine each of RGB exposures for colour. The telescope is a 10-inch F/4 Newtonian with a QSI 583 camera with Lodestar providing off-axis guiding mounted on an EQ6 mount.Image processing was with Deep Sky Stacker, Pixinsight and Photoshop. David Davies (20 April 2015). Image Courtesy of Steve Crouch, Canberra, Australia. Please click on the image for the high resolution version. 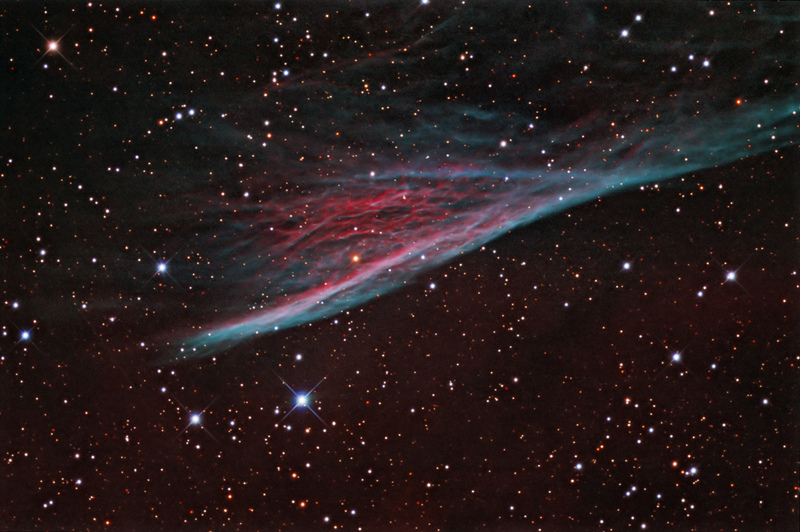 NGC 2736 is known as the pencil nebula and is an outlying filament of the Vela supernova remnant the centre of which being some 4 degrees to the west. It was discovered by John Herschel in 1834 and is sometimes called Herschel's ray . Ha:OIII:OIII with LRGB data. About 31 hours total imaging time. Our images this month are courtesy of David Davies from Cambridge in the UK. They provide an interesting comparison of the difference aperture can make when imaging nebulae. Please click on either image for the high resolution version. For more images from David please visit his Flickr Photostream. I've been collecting data for an image of the Cave Nebula over four nights during December (5, 7, 13 15) and it has been a chapter of carelessness and frustration. I ended up binning hours of data after discovering it was slightly out of focus or was captured with the wrong filters. In the end I did some work on what I could rescue and the attached image is the result. I set off trying to image the Cave in narrow-band but soon discovered that although the main cup-shaped nebula is rated as reasonably bright (integrated magnitude 7) it covers around 15 arc minutes of sky and is quite faint. The surrounding nebulosity comprising emission, reflection and dark nebulae is much fainter. Hydrogen-alpha emission can be acquired fairly readily but oxygen III and sulphur II emissions are very faint indeed. I decided to cut my losses and abandoned my acquisition of oxygen and sulphur, changed the filter wheel to RGB and acquired around an hour of each. I was interested to see the Cave in its context and chose to image it with my ED120 refractor plus a reducer/flattener to give a field of view of 81 x 61 arc minutes. The attached image is a crop to approximately 60 x 60 arc minutes. The image is Hydrogen-alpha, RGB; four hours of hydrogen-alpha in 20 minute subs; 132 minutes of RGB in 8-minute subs; all binned 1 x 1. Processing was in Pixinsight with a final touch-up in Photoshop. Telescope is Skywatcher Equinox ED120 with a Skywatcher X0.85 reducer/flattener. Camera is a QSI 583 wsg with Astrodon LRGB and 3 nm narrow band filters and Lodestar guide camera. Mount is a Skywatcher NEQ6 controlled via EQMOD. Image capture was with Nebulosity and Scopefocus for automatic focusing. I was curious to see what my 10-inch Newtonian would make of it so here is the Cave again but this time captured with a 10-inch Newtonian. The faster optics and longer exposures have yielded a deeper image. A hydrogen-alpha RGB image captured on the nights of 19 and 24 December 2014 from Cambridge, UK. Two hours each of RGB in 10-minute subs plus one hour of hydrogen-alpha in 20-minute subs. Telescope is a 10-inch Newtonian plus Televue Paracorr at F/4.5. Camera is a QSI 583 wsg with a Lodestar camera as off-axis guider. Mount is a Skywatcher NEQ6. Image processing with PixInsight and Photoshop. This magnitude 9.4 Seyfert galaxy is roughly 8.3' x 6.6' in size. It is the second brightest Seyfert galaxy after NGC 1068 (M77) and the brightest member of the Dorado galaxy group. The distance is not very accurately known and given as 38.4 million light years with an error of 18.6 million light years. This image shows a supernova (discovered in September 2014) just to the right of the central nucleus. The luminance data (with the supernova) was taken on 12 November 2014 when it had started to fade. The discovery visual magnitude was given as 14.6. RGB 100:100:100 all 1x1 with Astrodon filters using 31.75cm RC. Luminance 150 minutes with 36.8cm RC. This image is provided with the kind permission of Warren A. Keller and Jimmy Walker. Please click on the image to be taken to Warren's website for a higher resolution version. NGC 1333 is the bright nebular complex at center. A mere 1,000 ly from Earth, it consists of blue reflection nebulosity and many firey-red, Herbig-Haro objects which indicate active star forming regions. As such, NGC 1333 contains hundreds of stars less than one million years old- mere babies in astronomical terms. The associated Perseus OB2 molecular dust cloud complex seems to go on forever! Two other blue reflection nebulae can be seen near bottom and at 3 o'clock. Another lovely area of interest is the yellowish nebula surrounding the star HD 21110 above 7 o'clock. This is the first collaboration with my friend and imager extraordinaire Jimmy Walker whom I am extremely grateful to for data acquisition. Last Thursday, 2 October, was a particular clear, cold night with reasonable transparency. A bright first quarter moon did, however, restrict what one could see. I had a short-list of objects I could attempt to image in Cephus and Cygnus and settled on NGC 6946, The Fireworks Galaxy, Arp 29, Caldwell 12. This is my first view of this galaxy. We view it through plane of our own galaxy and it is significantly dimmed by the intervening stars and dust. The data defining the spiral arms were only a few hundred ADUs above the bright sky background given by the moon. For a while I wondered if I would achieve a presentable image, especially when I discovered that the 100 minutes of luminance data I had gathered were spoiled by a finger print on the luminance filter. I must have been really clumsy when I changed the filter wheel in the camera. So this image is essentially RGB only, comprising 45 minutes each of RGB in 5 minute subs. I constructed a luminance layer from the composite RGB image and separately processed that to make a final LRGB image. Telescope is a Skywatcher Quattro 254 mm F/4 Newtonian with a Tele Vue Parcorr. Camera is a QSI 583 with a Lodestar off axis guide camera guiding via PHD2. Image capture was with Nebulosity. Automatic focussing was with Scopefocus working with Nebulosity. Image stacking was with Deep Sky Stacker and processing with Pixinsight and Photoshop. This is a crop from the final image. It's been a little while since I've shared anything from the deep sky. I managed to be away during several of the clear nights we've had recently. My observatory was completed just over one year ago and the first object I observed from it was the Crescent Nebula. It seemed fitting to return to it this year and see if I could do any better. So I've spent several nights during August (17, 28 and 31) gathering narrow band data on the Crescent Nebula and further time learning how to process narrow band images. The attached is the result. I now have the benefit of automatic focussing which is helping I think by enabling me to refocus by remote control during the night. I'm using a Lakeside focus motor and the Scopefocus application from Kevin Sipprell in the US that works with my image capture software, Nebulosity. Viewing conditions were almost universally poor with poor transparency and high thin cloud. This image comprises 100 minutes of H-alpha and 200 minutes of OIII data in 20 minute subs, five hours in total, captured with a 254mm Newtonian and QSI 583 camera equipped with 3nm Astrodon filters. Processing was done in Pixinsight where H-alpha was assigned to red, OIII to blue and a synthetic green was generated using 85% blue and 15% red. I did try to combine the H-alpha and OIII with a normal green image and the result was just awful. I'm fascinated by this object. The great bubbles of OIII extend well beyond the normally visible object and are also evident throughout its internal structure. I'm continuing to capture RGB data and it would be interesting to see if I can combine the RGB and narrow band data in the future. A combination of faint emission nebulosity and a bright but scattered open cluster. The complex is about 4000 light years distant.